ImpactECS uses the perfect balance of finance and operations data to give you meaningful results. Our latest release focuses on improving the core user experience and simplifying the model development process. Many of the new features evolved from both client recommendations and our experience working side-by-side with costing pros during implementation engagements. It’s been said that a picture is worth a thousand words. 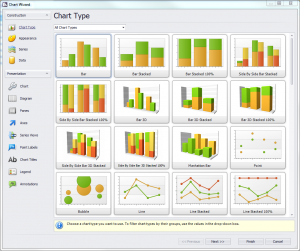 In the new release of ImpactECS, a picture is worth a thousand numbers with the new integrated charting feature. You can now build a variety of charts without the need to export data to spreadsheets. Charts are stored in the Reports folder and can be created from many of the ImpactECS item types including Cost Objects, Routings, Tables, and more. 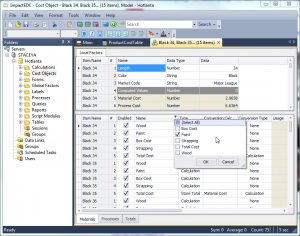 Model builders can create and edit Reports directly from the Desktop Client. This new workflow mimics all other Impact item types and replaces the previous requirement to launch a separate application to create or edit reports. Additionally, this new workflow allows the Excel Add-In application to remain hidden and disabled when not in use. The Desktop Client has a new integrated report designer for creating traditional or paper based reports. Integrating the report designer allows for the deprecation of the stand-alone Cost Report Designer application. This solution offers several benefits including ease-of-use, improved report rendering speeds and a more seamless workflow. 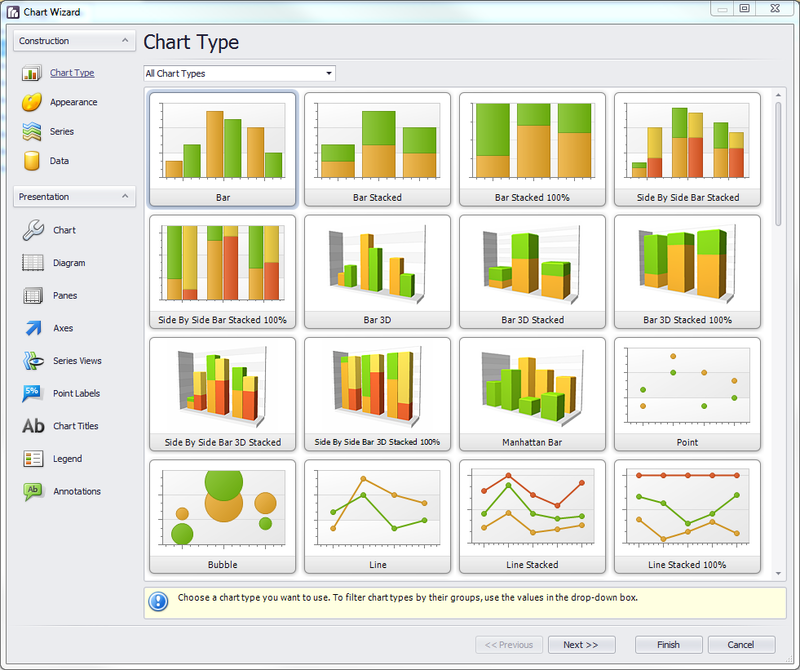 Additionally, the new report designer supports advanced functionality like charts, sparklines and pivot grids. Viewing, sorting, grouping and filtering information within ImpactECS has never been easier. With the newly developed grid controls, users have the ability to control how data is presented within a model. Improved performance: Lots of data? No problem. ImpactECS version 7.0 can handle large sets of data with ease loading tables with 100,000 items in just ONE second. Filtering: From simple sorts to advanced filtering capabilities, the new release gives end users control to decide how to view their data. 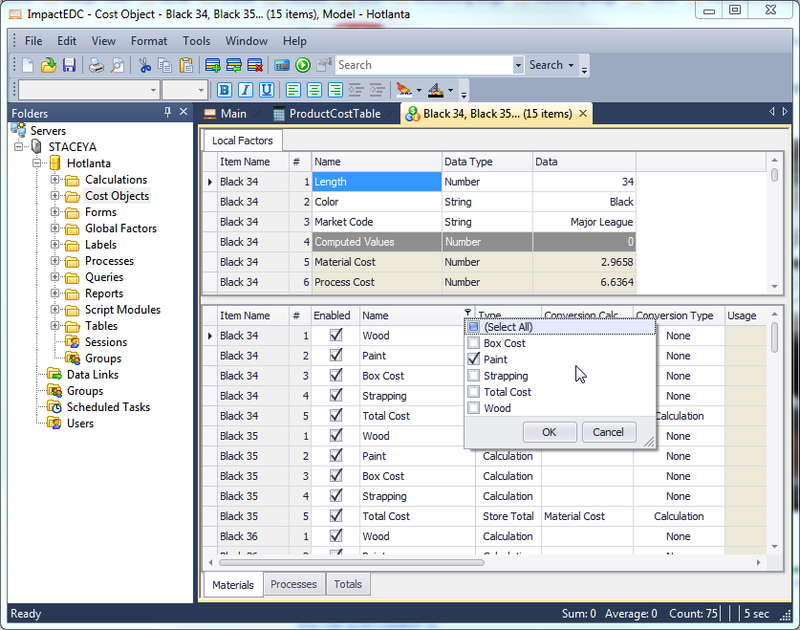 Editing: Multi-row editing makes table data maintenance quick and easy. With the latest release, ImpactECS has widely introduced the concept of Design Mode which keeps model building information out of sight for end users. By selecting the “Open in Design Mode” option for an item, the designer has access to tabs used in defining item characteristics. ImpactECS now supports authentication using Microsoft Windows Domain groups, giving IT administrators centralized and complete control of model security and access.